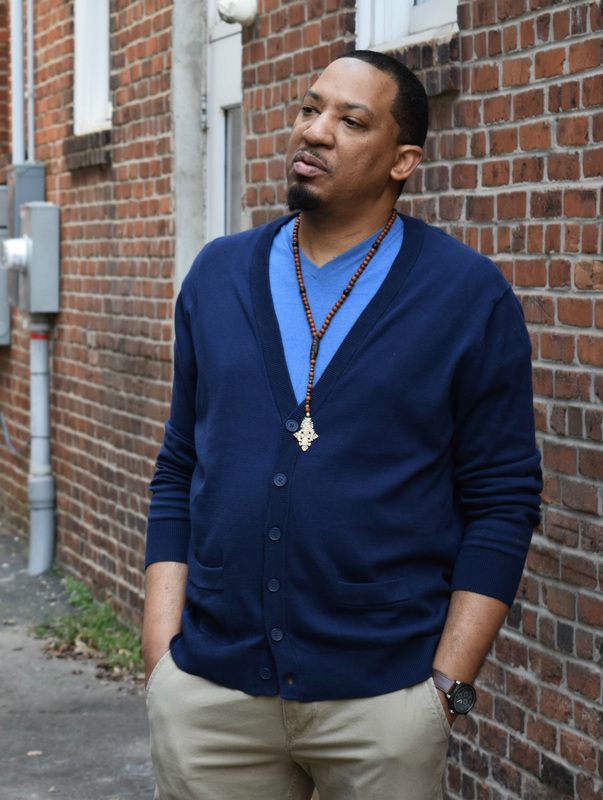 Dasan Ahanu - "Growing Literature, One Rose At A Time"
​whose real name is Christopher Massenburg, is a public speaker, organizer, workshop facilitator, poet, spoken word performer, educator, songwriter, writer, emcee, and loyal Hip Hop head born and raised in Raleigh, North Carolina. In addition to performing, Dasan has hosted many poetry, jazz, Hip Hop, and cultural arts events across NC. He is one of the founders of Black Poetry Theatre (BPT) where he has been a writer, director, producer, and cast member for their productions. As an active participant in poetry slam, Dasan has competed regionally and nationally as a founding member and coach of Durham, NC’s own Bull City Slam Team. In 2010 and 2014, Ahanu led the Bull City Slam Team in winning the Southern Fried Southeastern Regional Poetry Slam, the largest regional poetry slam in the country. He also led the team to a 3rd place finish at the 2010 National Poetry Slam and a 2nd place finish in Group Piece Finals at the 2012 National Poetry Slam. Dasan has created his own series of shows and collaborated with local promoters to provide some of the best arts and music events in NC. His work has been featured on National Public Radio (NPR) where he has been noted for his appearances on “News and Notes with Ed Gordon” and “State of Things with Frank Stacio.” His writing has been featured in online and print publications. He has been showcased on NBC 17 in for his work with poetry slam. He is featured on the third season of Lexus Verses and Flow aired on TV One. He was featured in a documentary entitled, “Poet Son” that aired on WUNC-TV as a part of the North Carolina Visions film series and was shown at film festivals across the country. In 2007 he signed with NC independent record label Amp Truth Records and teamed with up and coming music producer Picasso to form The Jim Crow Jackson Experiment. Their self-titled debut album was an amazing blend of spoken word, rap, soul, reggae, and blues and featured on sites like Allhiphop.com and Okayplayer.com. The album showcased both artists’ unique talents and was released both domestically and internationally. As a songwriter and recording artist, Dasan continues to record and release music with notable emcees, vocalists, and musicians from NC and along the east coast. Dasan has released two full-length books of poetry entitled The Innovator and Freedom Papers and toured with his last two spoken word CDs The Darkest Eye and Catharsis. He is preparing to release a new book of poetry with Flowered Concrete and is currently promoting a new spoken word project entitled, The Last Temptation Before Sunrise. Dasan serves as president of the Black Jedi Chapter of the Universal Zulu Nation, a global community organization that also fosters greater cultural awareness of Hip Hop. He is currently a 2015-2016 Nasir Jones Fellow with the Hip Hop Archive at Harvard University’s Hutchins Center for African & African American Research. Spoken word artist Dasan Ahanu reads his poem "Can I" at NPR.